There is an inspiring story behind how the October 5th Honor Flight Veterans were able to enter the barricaded World War II Memorial on the National Mall. Manuel Vega (Manny) lives in the D.C. area. He is a Marine with 3 tours of duty in Iraq. He served 5 years with the 1st Light Armored Reconnaissance Battalion at Camp Pendelton and was with the Staff NCO Academy at Marine Corps Base Quantico before leaving active duty in May 2011. On October 4th Manny put a post on his personal Facebook page that went viral when it was shared at Breitbart – One Voice Silenced, Millions Awakened. In the post, which you can read below in this article, he asked for others in the area to meet him at the Memorial at 9 a.m. to completely remove the barricades from the sight of the visiting Veterans. He didn’t want their view to be diminished or obstructed by seeing barricades when they approached. After the posting, and early in the morning of October 5th, Manuel had contact with an organizer who told him he should be on the Mall by no later than 7 a.m. if he wanted to get the barricades moved, so he was there, but the viral plea for live human bodies to show up and help had yielded only two others, personal friends Bill Main and Curtis Hazen. With Park Police everywhere it became apparent that the 3 of them could not move the barricades across the street to the planned grassy area – completely out of sight, without being detained. On that day, the Bikers Ride escorted buses carrying the Vets from the airport to the Memorial, so they were doing their jobs – their honor rides – and were not yet on site. Manny got word that the first bus of Veterans were arriving. He hadn’t yet removed a single barricade. He walked to a spot where he could see a bus coming and stood there holding the flag you see in the photos above and below. The bus driver saw him, stopped and began off-loading. Park Rangers arrived and told the Veterans they could not enter at that spot. They had to walk “to the left” before entering – a long walk. The video below gives the best perspective I’ve seen of how large the area is and what a challenge it would be for an aging group of warriors. Manny simply removed sandbags, and opened the entrances on both sides and called them to enter: “Come on folks, the Memorial is open,” repeated more than once that day. It became a game with the Park Rangers. Manny would open one side, people, not just veterans but joggers, regular sightseers, and surely families bringing their WW II Veteran with them to see the Memorial, streamed in. Manny would walk to the other side and repeat the opening. At the same time, Park Rangers were closing the opposite side, but many people were gaining entrance. The Rangers were not aggressive, just doing their jobs. Two bus loads entered during the game of opening and closing. Then the Rangers gave up, stood back and let people in. Manny assumes that continued for the remainder of the day. After the last Honor Flight arrival, the bikers were able to stay on site. PEOPLE, URGENT! IF YOU HAVE FRIENDS IN THE VIRGINIA, MARYLAND, PENNSYLVANIA, WEST VIRGINIA REGION, SHARE WITH THEM. Tomorrow morning at nine o’clock. I will be at the World War Two Memorial on the Mall in Washington. We who gather there will demand the National Park Service Rangers to remove the barricades. We will give them an ultimatum. If they do not remove them by 2:00 in the afternoon. We will remove them by force. No weapons will be brought to this event. We need people, many people. PREPARE TO BE ARRESTED OR DETAINED. Show your true American colors and be there. Bring your Star-Spangled Banner with you. We cannot permit this spiteful act by this third world, banana republic dictator wanna be, to go unchecked by We the People, the first branch of government. We will remove these barricades and that is our intent. Shutdown or no shutdown, this is ridiculous. Tyranny always starts small, inch by inch and this is one example of many. Enough is enough! If we didn’t have any of our Second World War veterans alive today, We the People wouldn’t have access to honor them by visiting these memorials. Those barricades are an eye sore, should not be there in the first place and they must be removed. 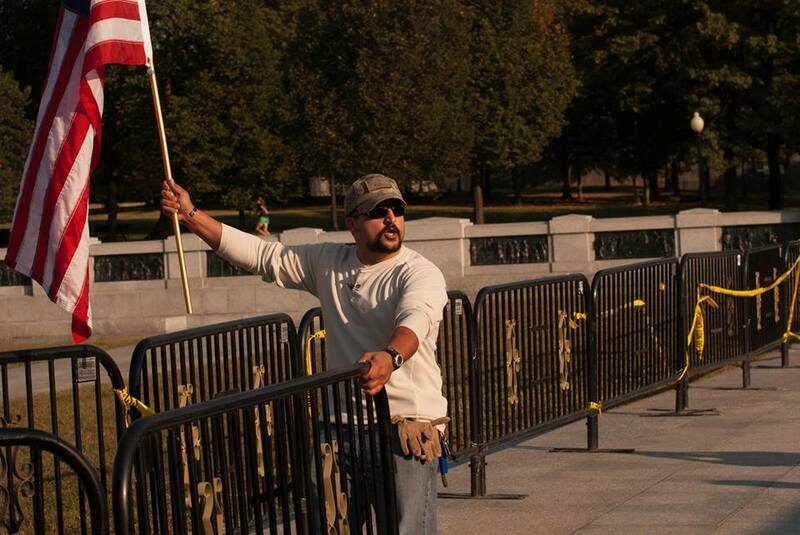 Lastly, our World War II vets should not have to enter the memorial through those barricades. Also, those are Our barricades, we paid for them. Contact me if you are seriously intending to attend tomorrow, so we can meet and coordinate. I will do this alone if I have to. Note that he clearly states his intention is to remove the barricades by force if necessary, but to be on the Mall unarmed – no weapons. He told Manny that the Park Service didn’t know what he meant when he wrote: “We will remove them by force.” Guess they chose to ignore the part about no weapons, and the willingness to be arrested or detained which generally doesn’t indicate bashing a head with a baseball bat. Vega and Beth Crumley spent time talking to Congressman Steve King (R-IA) at the Memorial who Manny said was concerned for our country, genuine and open to listening. As you know, I’m an Oklahoma girl, and as it turns out Manny’s good “buddy” in the Marines was Oklahoman Natchez Little Fawn Washalanta. ‘Wash’ or ‘Chez’ was a good “buddy” to many in his unit. 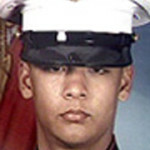 He died at age 21 in combat on August 21, 2004. 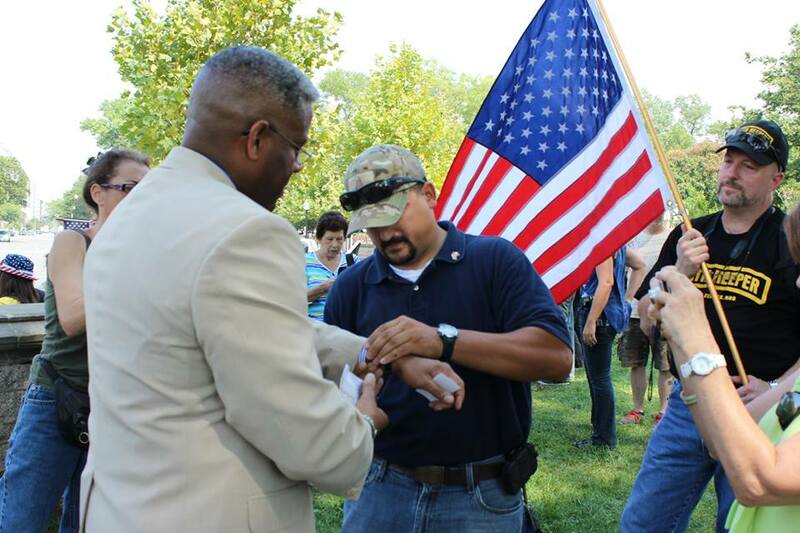 On September 11, 2013 Manny was at the Capitol and had the opportunity to talk with former Congressman, Colonel Allen West. In the photo below you see Manny adding his own Memorial Bracelet for Washalanta to the wrist of Colonel West. Any man who tells a superior officer he would “walk through hell with a gas can” if it would protect his men, is a hero. That’s exactly what Allen West did. Manny is only 28 years old, soon to be 29. Talking to him is like listening to an audio book of all the history of this country so dear to you and to me. Born in Puerto Rico, he came to the U.S. when he was 7 years old. He was 16 on September 11, 2001. He turned 17 on November 9th. On November 12, 2001 his mother reluctantly went with him to join the Marines. 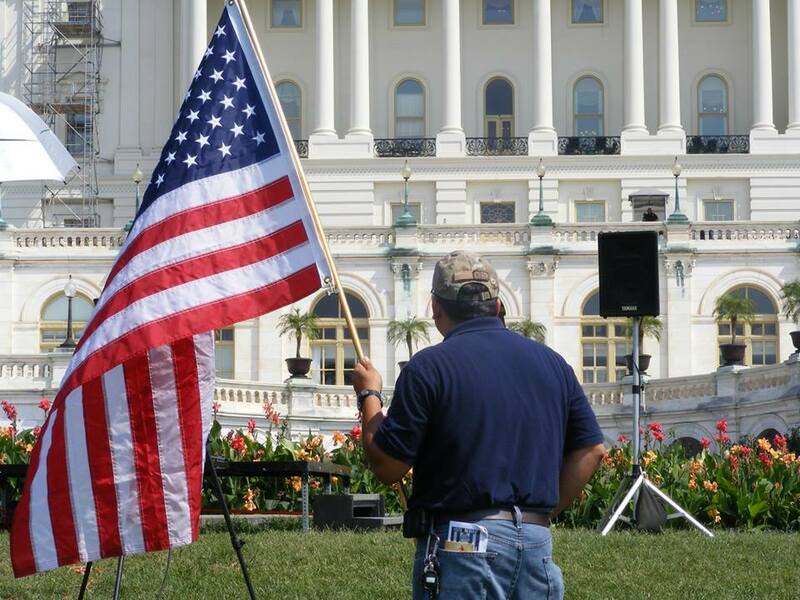 On Sunday, October 13th he will be on the Mall again as one of the Million Veteran March. He is not a leader or organizer. He will be there as one more Veteran to honor all who have sacrificed, and to do whatever he is asked to do. Note to readers: Every time I speak with those involved, they say “it’s not about me.” No one is looking for self-promotion, but in my view, if you don’t know the stories, you don’t know what’s going on, and to give you a story, I have to give you a name. There are hundreds of stories, I’m sure. I have just a few to share with you. Maybe there will be more as these events continue throughout 2014. See below the “ride” and “march” events coming up the weekend of October 11, 12 and 13, 2013 and contacts where you’ll find updates. If you need a ride to the Million Vet March, read on. 9 am at National World War II Memorial, Washington DC and other Veterans Memorials Across the United States. This Sunday, 13 October is a huge day in DC. 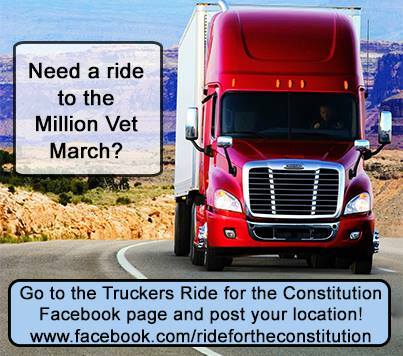 We not only have our Patriot Truckers Ride For The Constitution in town, but there is also the Million Vets March and more WWII vets coming in to see THEIR memorial. There is a group of us from Western and Central Maryland that are riding to DC the morning of Sunday, 13 October, to be a part of these events. BUT! !…we will be leaving early to get under much of the traffic and other madness of that day and we will not be taking I-270 in because of the trucks. I will be at the AC&T station, 1449 South Potomac Street, Hagerstown, Maryland with KSU at 5:30 a.m. We will be riding to Frederick, Maryland, and meeting more riders at Harry Grove Stadium, with KSU at 6:00. Note: The meeting place at Harry Grove Stadium will be the large Parking Lot off of New Design Road, NOT the lot at the entrance to the stadium. If you want to respond and let me know you’re coming, that’s fine. It’s always nice to know the size of the group. However, it is not necessary that you respond. You are welcome to just show up if you wish. I have said this before and I’ll say it again! We roll with honor! We roll with respect! We roll with dignity and substance! We represent the best that is in America! If you’re going into DC to bust stuff up or be confrontation, please reconsider this ride! We are doing this to support the truckers, support the Million Vets March, and to support our WWII vets, not ourselves! I can assure you that any rider with hostile intents will be confronted by your patriot brothers and asked to stand down! It will also be the last time you ride with us!! We will know when our day has arrived! In the meantime, let’s roll!! 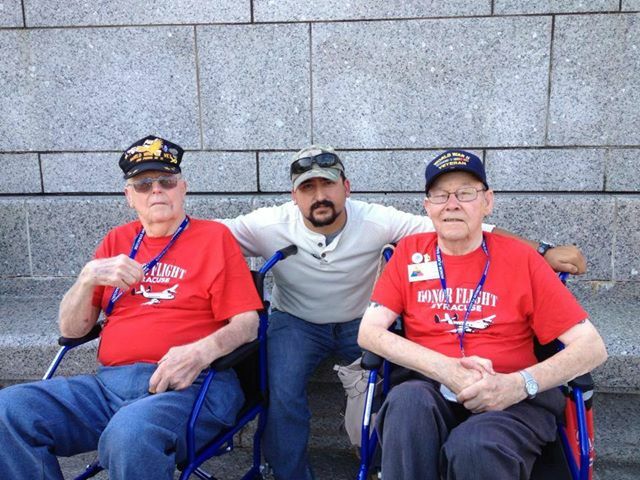 What a great story…Americans…and especially, American Vets DO NOT GIVE UP! It was thrilling to see the veterans, the Bikers and the Truckers ALL out in force. They ALL showed Washington D.C. WHO AMERICA IS!! They cannot change that with the vicious tricks.